Whitney Elizabeth Houston (August 9, 1963  February 11, 2012) was an American recording artist, actress, producer, and model. In 2009, the Guinness World Records cited her as the most-awarded female act of all time. Her awards include two Emmy Awards, six Grammy Awards, 30 Billboard Music Awards, and 22 American Music Awards, among a total of 415 career awards in her lifetime. Houston was also one of the world's best-selling music artists, having sold over 170 million albums, singles and videos worldwide. 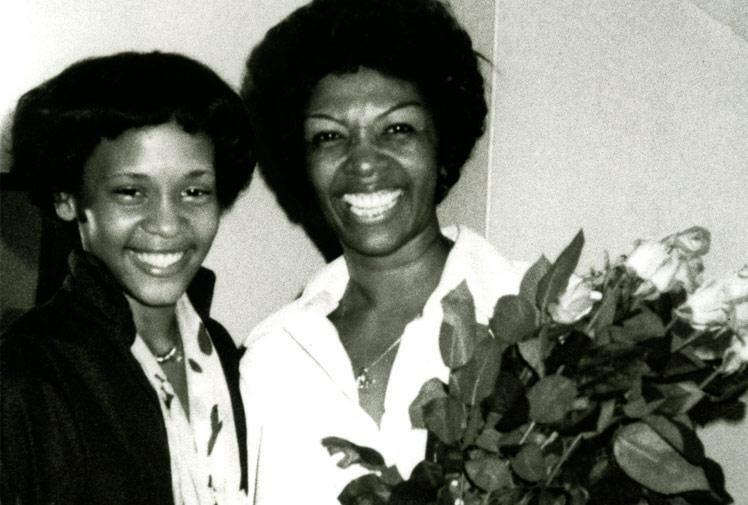 L-R: Whitney Houston and her mother, Cissy Houston. 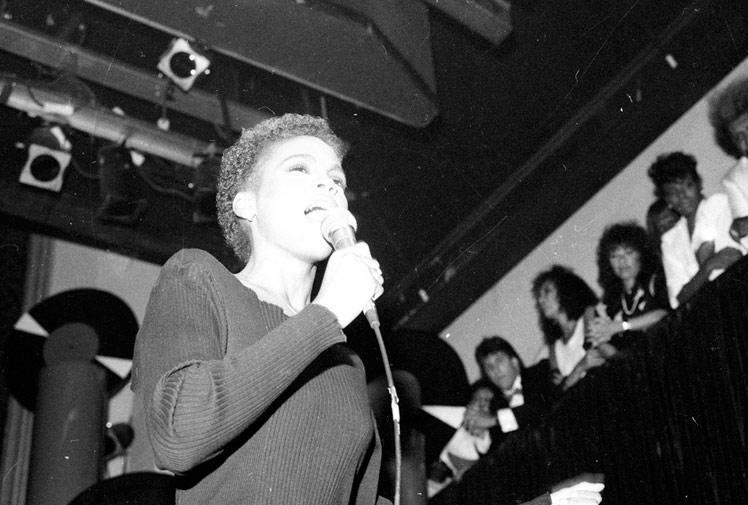 Whitney, born in Newark, NJ in 1963, grew up in a family of singers. Besides her mother, Grammy-winning gospel singer Cissy Houston, she sang with her cousins Dee Dee and Dionne Warwick, and godmother Aretha Franklin. In 1968, after the Newark Riots, the family moved to neighboring East Orange, NJ, but continued to attend church in Newark each Sunday. 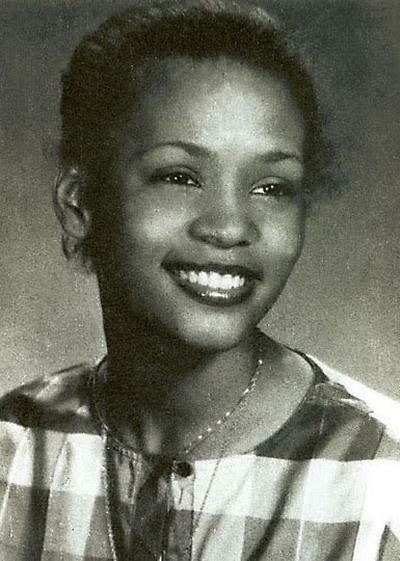 Whitney was enrolled in Franklin School in East Orange. At the age of eleven, Houston began singing at The New Hope Church on Sussex Avenue in Newark as a member of a junior gospel choir. Her mother was in charge of the adult music programs there and they often sang together. Above is her high school yearbook photo from Mount Saint Dominic Academy in Caldwell, NJ. She devoted her spare time to singing in the choir and also singing with her mother at night clubs in the New York City area. In 1983, she was "discovered" by Arista Records label head Clive Davis. 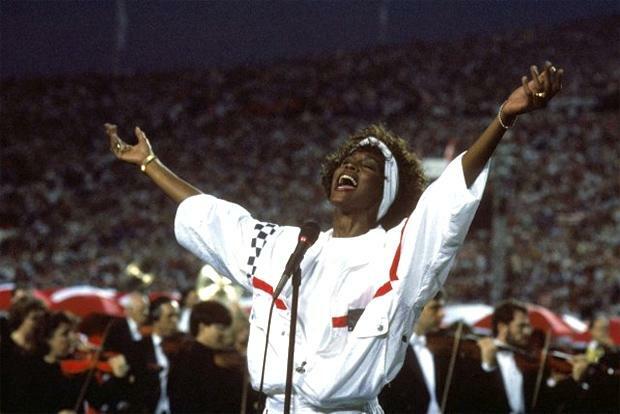 Whitney Houston sang the National Anthem at Super Bowl XXV between the New York Giants and Buffalo Bills game in Tampa Stadium on January 27, 1991 in Tampa, Florida. Because of the overwhelming response to her rendition, it was released as a commercial single and video of her performance, and reached the Top 20 on the US Hot 100, making her the only act to turn the national anthem into a pop hit of that magnitude (Jose Feliciano's version reached No. 50 in November 1968). Houston donated all of her share of the proceeds to the American Red Cross Gulf Crisis Fund at this time of the Persian Gulf War. 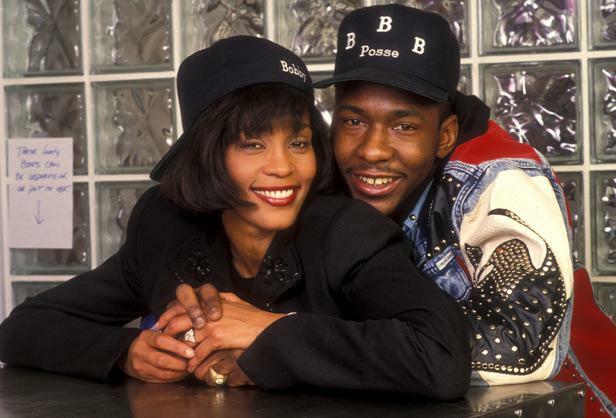 After a three-year courtship with Bobby Brown, the two were married on July 18, 1992. On March 4, 1993, Houston gave birth to their daughter Bobbi Kristina Houston Brown, her only child, and his fourth. Houston's first acting role was in the feature film The Bodyguard in which she costarred with Kevin Costner (1992). The film's original soundtrack won the 1994 Grammy Award for Album of the Year. Its lead single, "I Will Always Love You" written and recorded by country singer Dolly Parton in 1974, became the best-selling single by a female artist in music history. With the album, Houston became the first act (solo or group, male or female) to sell more than a million copies of an album within a single week period. Houston continued to star in movies and contribute to their soundtracks, including the films Waiting to Exhale (1995) and The Preacher's Wife costarring with Denzel Washington (1996). The Preacher's Wife soundtrack became the best-selling gospel album in history. Three years after the release of her fourth studio album My Love Is Your Love (1998), she renewed her recording contract with Arista Records. 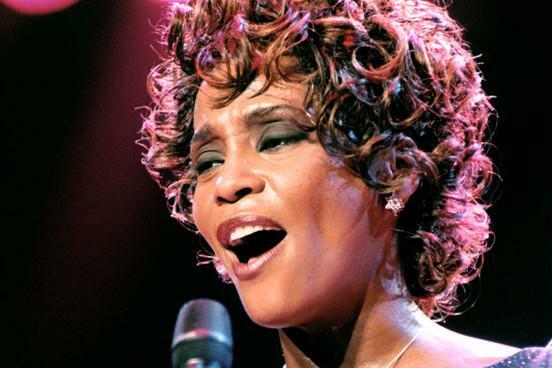 She released her fifth studio album Just Whitney in 2002, and the Christmas-themed One Wish: The Holiday Album in 2003. In 2009, Houston released her seventh studio album, I Look to You. 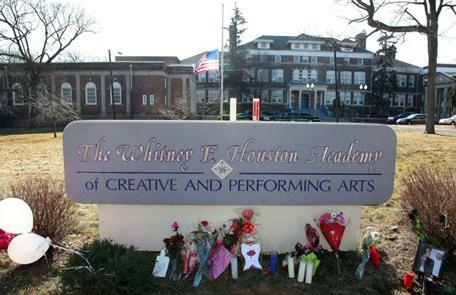 In 1997, she attended the rededication of Franklin School in East Orange, NJ, which Whitney Houston had attended as an elementary school pupil, now renamed to the Whitney E. Houston Academy of Creative and Performing Arts. In the background is husband Bobby Brown. There is so much of her music on records and videos that we have provide this link to her official biography Web site where you can get more information and dates important to her life and career. Monday, 2/13/12. 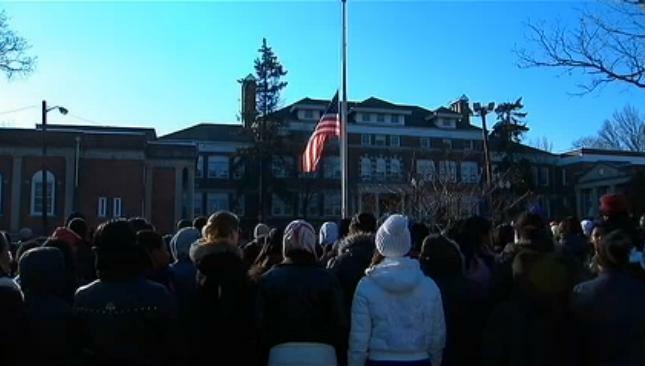 After hearing of Whitney Houston's tragic death on 2/11/12, students of Whitney Houston Academy in East Orange gathered in front of the building to salute a half-masted flag and remember the singer as she was. Then they released white balloons into the sky. 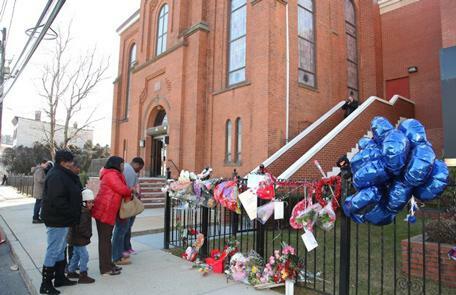 At the school in East Orange, and in front of New Hope Baptist Church in Newark where she sang in the choir, those who honored her memory left flowers, balloons, and cards. Her funeral was held at the church on Saturday, 2/18/12. The church was too small for the millions of fans, worldwide, who wanted to attend her funeral, but it was Webcast to the world. The best news review of the funeral noted that "The best voices of a generation all paid tribute to her. But in the end, the most powerful voice at Whitney Houston's funeral was her own. - Nekesa Mumbi Moody - Associated Press Music Writer."